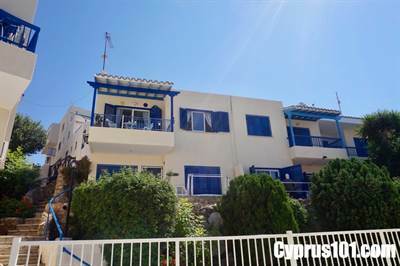 This semi-detached two bedroom apartment is located on a charming and well managed complex in the popular village of Chloraka. Local shops and restaurants, the beach and public transportation are all within walking distance and Paphos town is a 5 minute drive away. The accommodation features an open plan living room with sliding patio doors leading out to a balcony overlooking the pool, from where you can enjoy spectacular panoramic coastal views and beautiful sunsets. The fully fitted kitchen with white units is nicely separated from the dining space by a wood topped breakfast bar. A wide decorative archway leads from the living room to two good sized double bedrooms with fitted wardrobes and shutters, plus a separate family size bathroom. The complex itself has lots of character including traditional stone featured walkways. Facilities include an impressive mosaic tiled swimming pool, large surrounding sunbathing terrace with sea views, children’s paddling pool plus changing room, toilet and shower facilities. There is plenty of both covered and uncovered parking near the property. Well maintained and ideal as a holiday home and/or rental investment, this character property comes fully furnished and has title deeds.